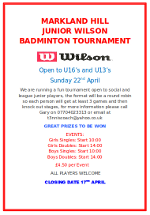 On Sunday 22nd April 2012, Markland Hill are running a junior badminton tournament. There will be two different age groups, U16s and U13s. The tournament will feature competitions for boys singles, girls singles, boys doubles and girls doubles. The entry fee is £4.50 per player per event and the deadline for entries is 17th April 2012. For more information check out the poster here and the entry form can be downloaded here.